Swim – 500 yards enclosed open water swim in Lake Redman. Swimmers will be set off in waves that will be determined by cap color. Bike: The bike route is a scenic 15-mile rolling hill course on back roads. The roads are not closed to traffic. Helmets are required. *Safety volunteers will be stationed throughout each event. 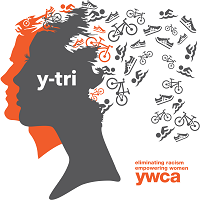 The Y-Tri is not a sanctioned event but will follow USAT Rules. Fire Police will be placed in key areas on the bike and run routes for traffic control. Volunteers will also be at key areas to provide directional assistance and to cheer on athletes, including in the lake on kayaks and canoes. There are no refunds or deferments for this race.